Have you heard of Pete Bethune? For most people, the answer would be “no”, but a little research tells us he’s a name worth knowing. Born in New Zealand in 1965, Pete has a background in oil exploration and automated camera systems, but it was while studying for his Masters that he developed a passion for renewable energy, in particular biodiesel, and set on the path to becoming one of the world’s most-renowned conservationists. To promote his passion for biodiesel, Pete teamed up with LOMOcean (innovative native New Zealand naval architects) to create a radical new vessel – ‘Earthrace’. The 24 metre wave-piercing trimaran hit the water in 2006, and by 2007 had made her first circumnavigation attempt – mechanical problems forced an abortion. In 2008 Earthrace made a second attempt and this time smashed and set a new world record coming in at just under 61 days for circling the globe. 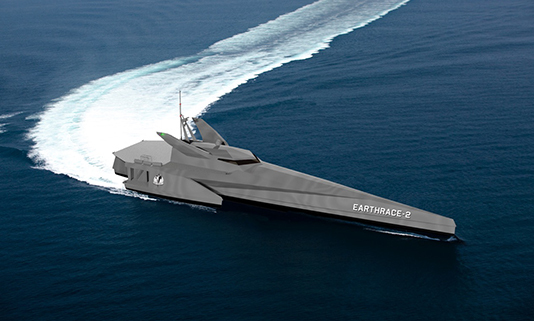 Having proven her worth, Earthrace joined non-profit marine conservation outfit, Sea Shepherd, in its attempt to disrupt Japanese whaling under the codename ‘Waltzing Matilda’. Hollywood magnate Ady Gil donated a million dollars to the project, so Earthrace got a layer of protective Kevlar and a sleek black paint job and was renamed ‘Ady Gil’ in his honour. Off she went to intercept the slaughter of whales. Her mission was short-lived. On 6 January 2010 Ady Gil, captained by Pete Bethune, collided with a Japanese whaling vessel and subsequently sank. A month later, on 15 February, Pete boarded the very same whaling vessel to conduct a citizen’s arrest on the captain, saying he attempted to murder him and his crew, and also presented a three-million-dollar bill for the loss of Ady Gil. Things didn’t quite go to plan with Pete being arrested, held in a maximum security prison in Tokyo for five months, and deported back to New Zealand. Although it certainly brought Japan’s illegal whaling programme to the forefront of international consciousness. A storm of controversy surrounds the incident, shifting blame from the Japanese to Pete to Sea Shepherd, and various court proceedings continue as recently as this year. But that was then (a chapter I daresay Pete is trying to forget) and this is now. What has he been up to since? Upon release from prison Pete resigned from Sea Shepherd and set up his own non-profit, Earthrace Conservation. 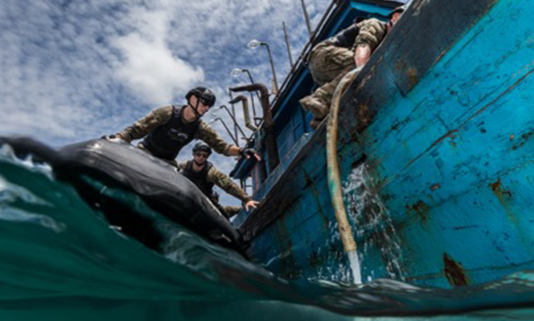 He now employs a crack team of well-trained former-military individuals who tackle tricky targets in equally tricky situations – from seal clubbers to shark finners and rhino poachers to wildlife smugglers. 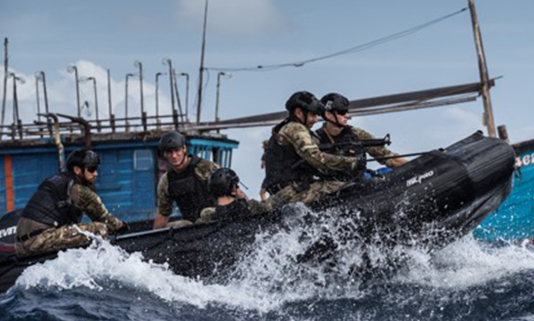 From saving their countries to saving the planets, the team has caught illegal fishing vessels in Central America, Asia and Africa, closed down two gangs involved in wildlife smuggling in Asia, exposed illegal logging operations in Indonesia and caught illegal gold miners in Costa Rica. Their missions are documented in a TV series called ‘The Operatives’. However, what Pete desperately lacks is another Ady Gil. And he has recently launched a Kickstarter campaign to get Earthrace 2 off the ground. Also designed by LOMOcean, Earthrace 2 is a bigger (60 metre) better trimaran, which will become Pete’s new base of operations and star of the next ‘The Operatives’ TV series. Radical and edgy in design, it will have a 10,000 nautical mile range, run continuously for up to 28 days, host a crew of 26, have a top speed of around 25 knots and house a range of deployable support vessels. Being a trimaran, it will offer great seakeeping ability and stability. Oh, and yes, she will run on renewable energy – natch. The initial Kickstarter asked for 50,000 dollars to complete designs (it raised 83,237 dollars) and construction is expected to start later this year/early 2017. So now you know all about Pete Bethune. Commit his name to memory and keep an eye on his ever-colourful life story here – http://earthraceconservation.org/.